After my stressful trip back to Bangkok, I spent my last days in Thailand with Rathana, just chilling out and doing relatively normal things – going out for dinner, having a few drinks at a sky bar, watching a movie, doing a bit of shopping and chilling by the pool. When I think about it, it’s those little things that I really enjoyed about my time abroad. While it is fine to be a big ol’ tourist and gush over temples and beaches and resorts and all that jazz, I love the feeling of spending time just being in a foreign city and really living there, doing all the regular stuff as well as all the typical holiday things. I haven’t really figured out what I want to do with my life when, God forbid, this incredible journey comes to an end, but I must say that I’ve really developed a taste for living abroad. That issue is a can of worms in itself, though, and for now I just want to reflect on some things I’ve noticed, lessons I’ve learnt, and the life I’ve experienced during my time in South East Asia. One thing that I was expecting, yet still deeply shocked by, was the prevalence of poverty in these countries. It broke my heart to see so many children in the streets, whether it was the boy in Saigon performing gruesome tricks such as breathing fire, chewing hot coals and eating razor blades, then approaching the crowds of beer-drinking tourists for a donation, or the little girl following me through the temples of Angkor Wat desperately trying to sell me five fridge magnets for a dollar, or the little girl carrying her baby brother, standing next to my table at a cafe in Siem Reap pleading, “Please, I don’t want money, I just want food.” It makes you want to run to the ATM and empty your accounts into their starving little hands, but I’ve been warned by so many about the poverty traps that evolve from giving these kids money, encouraging the very behaviour that keeps them on the streets and out of school. Back in Ho Chi Minh City, Allistair told me he sometimes gave them a little bit of money, but made them promise that they would get off the streets and use the money to go to school. Yet I wonder how many kids actually listen to his advice, and how many just see it as another reason to continue with their begging. Other people suggest that sitting them down and actually buying them a meal is a thousand times better than giving them money could ever be. However, I had a rather unpleasant experience in restaurant in Phnom Penh when it came to offering food. I had ordered pizza and a beer, and was sitting on a table facing out into the street, catching up on some blog posts and sending a few emails home on my iPad. Cambodia is full of people selling things on the street, whether its sunglasses, books, bracelets or marijuana, but it always tugs your heart strings a little to see children working on the streets like that. So when a little girl failed to interest me in the bracelets she was selling and her eyes fell hungrily onto the pizza in front of me, I finally caved in. “Sure,” I said with a smile, “I’m probably not gonna eat the whole thing anyway.” I pushed the plate slightly in her direction, and she leant over and lifted a cheesy triangle out and took a bite. What I hadn’t anticipated, however, were her three smaller companions all wanting their own pieces of my pizza too. “Oh, ah… Sure, take two,” I mumbled mostly to myself, because the little boy hadn’t waited for my permission to take a piece. I still wanted to have some of the pizza myself, so after that I pulled the plate back towards myself and took a bite out of one of the remaining pieces. Another little boy stood staring at me expectantly. “Can’t you guys share?” I asked, motioning to the second piece that the first little boy had taken. I realise how awful and selfish that sounded, but I was trying to strike a balance between enjoying the food I’d ordered for myself and helping these little kids out. Yet they seemed so angry when I refused to give them any more of my pizza. “Look what you have, you have so much!” they yelled, pointing at my iPad and my beer. I’d have felt a little more guilty if they hadn’t started to harass me so much, with one of the boys sneaking around into the restaurant and behind my chair. I pulled my backpack close under my legs, huddling over my table, and I felt like someone with a bag of hot chips who had just been discovered by a flock of seagulls. The boy got so bold as to reach over and touch my iPad – I’m not sure if he was hoping to achieve anything, perhaps disturb the file I was working on, or simply just annoy me. He failed in the former, but definitely succeeded in the later. I’m not proud to admit it, but after that I ended up losing my temper and swearing at them, in an attempt to scare them off. Yet the girl, who seemed to be the leader of the small group, only came back with a greater fury, spitting my curse words back at me. I was in shock – how did what I thought was a simple gesture of kindness turn so bitter so quickly? The ordeal finally ended when the restaurant owner came out and had a word with the kids in their local tongue, and I relocated to a table further inside the restaurant. It had been a prime example of biting the hand that feeds, and I hate to admit that those children ruined it for all the others – I couldn’t bring myself to donate to any more street children, be it food, money, or anything else, because I was afraid of it escalating into another nasty situation. To revisit a topic from a previous blog, I found the notion of love and relationships to be quite peculiar in South East Asia. As Anna had pointed out to me earlier on in my trip, their definition of love is something very different to our Western ideals of romance.There is a huge emphasis on tradition and family, which is a whole topic worthy of analysis in itself, but in this culture it’s probably similar to what we would call “living the dream” back at home – a white picket fence, happy marriage, two point five kids and an SUV parked in the driveway. Yet in Western culture, it’s becoming increasingly more common to break from the mould and live the life you want to live, not the life that’s expected of you. That trend hasn’t caught on in Asia. One of the conversations I had with my host while I was Couchsurfing in Vietnam was about relationships. “I really want a boyfriend,” he had told me. “I want to start a family. I know I have my studies to finish, but I really want to start my life now.” When I suggested that there was more to life than relationships and family – or rather, one didn’t need to start a family to feel complete – he practically scoffed at the idea. I told him about several of my previous boyfriends where the topic of children had been discussed – not specially about us having them, but our individual views on the idea – and how every time I had been sure that I had a lot more life to experience before I was ready to settle down, let alone have a baby or start a family. But for him, all he could hear was the ticking of his biological clock. Being gay is one thing, and I was glad that while he wasn’t out, at least my host himself accepted his homosexuality. Yet for him the idea of disappointing his family, and not doing all he could to support and foster those basic traditional values, was a worse crime than loving a man would ever be. And as my journey continued I saw this theme continue. Any local Asian boy was never just interested in a playful flirt or casual fun. It seemed as though they were all on a similar mission as my Couchsurfing host – to find the love of their life, to cherish and treasure and protect and look after. Which is an admirable quality – God knows it’s one I struggle with – but I can’t ignore the fact that they seem to be rushing through life without appreciating being young. I scoff and roll my eyes at the Westerners I know who are married at age 20, almost exclusively for religious reasons, and I would be quick to do the same again now if it weren’t for my realisation that its so ingrained into the culture, insofar that any other way of life just seems ludicrous. Which I guess is only the tip of the iceberg that is the essential difference in culture. I know it sounds obvious, and I’ve read dozens of books on the subject during my sociology degree, but it really took being and living in these places to comprehend the enormous differences in culture. ‘They do things differently in Asia’ is such an incredible understatement. It’s not just a different way of doing things, it’s a different way of thinking things – a different state of mind. You especially notice it when you run into other Westerners, and they seem just as confused as you do about some of those things. Because the list is endless. I’ve had waiters who don’t understand the concept of tipping, and will actually refuse to take your money. I’ve bought items at a third of their original marked price, all because I didn’t seem interested at the beginning – the shopkeeper literally haggled herself down. As a white person I feel as though I’ve been both the receiver of special treatment and the target of multiple scams, all based on the idea that anyone from the Western world is insanely rich. Which, comparatively, most of us are. It’s a slightly uneasy feeling when it comes to haggling over an amount which literally converts into a couple of dollars back home. In Australia, I would have written it off as a couple of dollars, nothing major. Being in South East Asia almost had the reverse effect on me – in a place where the currency goes a lot further, we seem to want to make every cent count. Yet when we’re shaving a couple of dollars of the price that we’re paying, most of us don’t think about the money that the local seller is not getting, and how much more that money might mean to them than it means to us. Cultural differences aside, I’ve had an amazing beginning to this year-long journey. I’ve been molested by monks and monkeys, run through the crowded streets of Thailand with super soakers, been moved to tears by the histories of Vietnam and Cambodia, won a game of Trivial Pursuits in the suburbs of Saigon, fallen off a motorbike in the middle of Phnom Penh, crammed myself into multiple night buses, and drunk an excessive amount of beer. Just to name a few things. 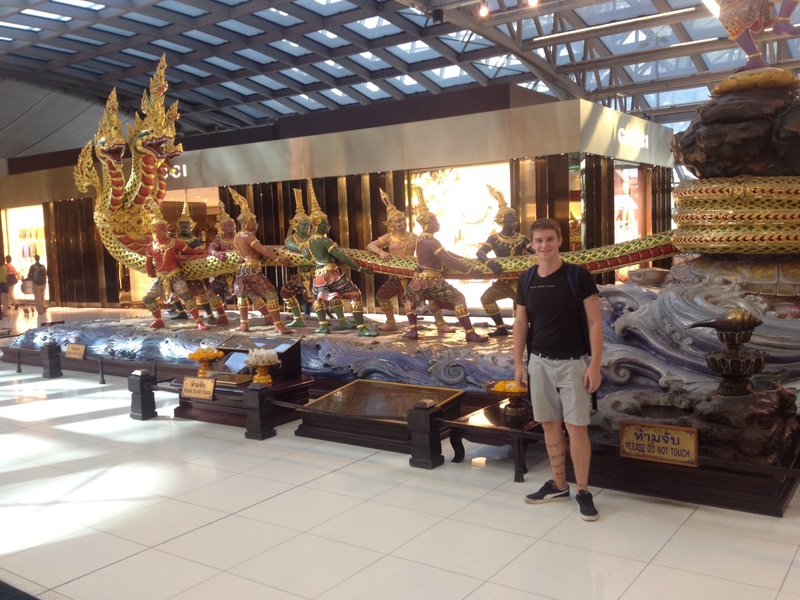 Saying farewell to South East Asia at Suvarnabhumi Airport BKK. As I board my plane to Beijing, I definitely feel a sense of accomplishment. I’ve only been travelling for six weeks, and a lot of people would say that that isn’t a long time at all. Which it isn’t – perhaps about a seventh of my journey in total. But I’ve seen so many places and met so many people that it definitely feels as though its been a long time. In the monotonous routine of life, six weeks can pass in the blink of an eye, so I feel confident that I’ve made the most of every second I’ve been away, experiencing the highs and the lows, the good and the bad, the wild and the crazy and the awe-inspiring. Yet the truth is that I rushed through South East Asia. There’s still a handful of other countries I would loved to have visited had I had more time, and definitely scores of new and exciting things to see when I eventually return. But now the next stage of my adventure is calling me, along with what I’m sure – and actually hope – are a host of crazy new stories to be told. During my stay in Ho Chi Minh City, I thought it was only appropriate that I explore a little more of Vietnam before heading off to the Cambodian border. After sussing out the logistics of my various options, I decided that heading south to the Mekong River delta would be the most interesting and diverse experience. The day trip involved a two hour bus ride out of the city, so I rose uncharacteristically early that morning and trudged onto the bus still half asleep, yet curious to see what the wider country of Vietnam would have in store for me. The Mekong River is the largest river in Asia, starting in Tibet, and flowing through China, Laos, Cambodia and Vietnam, where it divides into 9 tributaries that all flow out separately into the South China Sea. The south of Vietnam is known as the ‘Rice Bowl’ due to the established crops and farms throughout the region. The real tour started at a riverside town called My Tho, and from there we walked through the jungle on a small undergrowth trail until we reached the river. From there we got into small wooden row boats that took us down a narrow river system that was surround by thick vegetation on each side. We weren’t too far from the main roads, but we were well and truly out of the city now, and floating down the river in the long rowboat really gave me an idea of Vietnamese culture that was probably a little more traditional then either of the living situations I had experienced so far. The short trip took us to a modest little business that turned out to be a factory for making coconut candy. We were able to taste some of the sweet substance right as it came out from melting and thickening over the fire – it tasted a bit like fudge – and were given the opportunity to buy some. That was the first inkling that I was on a tour that I’d heard been referred to as a “tourist trap”, where the initial cost of the tour is cheap, but all the extras come at an additional cost, and almost every stop along the way tries to sell you something. The smaller, secluded sections of the Mekong River. After we had concluded business at the candy factory, our tour guide fetched a hessian bag, reached inside and produced a snake from within the depths of the sack, immediately offering it to individuals in the group to pose with it and take photos. 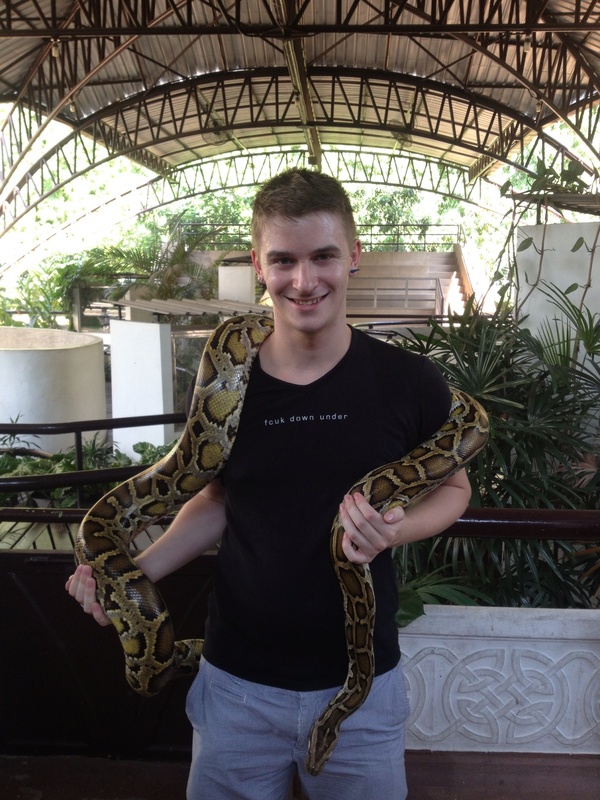 Luckily I had faced and conquered my fear of snakes back in Bangkok, otherwise my reaction to the surprise might have been extremely embarrassing. On the contrary, I couldn’t wait to get my hands on the reptile – or to be more accurate, to get the reptile around my shoulders. I thought back to the fearless little ten-year-old boy I had been when I visited the Steve Irwin’s Australia Zoo in Queensland, itching to get my photo taken with the huge python, and realised that I’d come full circle again. I didn’t even flinch as the tour guide draped the snake over my shoulders and looped it around my neck. Getting friendly with the locals. After the reptilian meet-and-greet, we jumped on another larger boat and headed down and across the river to another town named Ben Tre. We had lunch at an elephant fish ear farm – large flat fish that resemble their namesake. However, that particular delicacy was another tourist trap that wasn’t included in the price of the tour, though I’m not a huge fan of fish and was able to settle with tour included beef and rice dish. I sat at a table with two couples – a pair of British 27-year-olds taking their annual holiday, and another retired British couple who now lived on the Sunshine Coast in Australia. They were all very nice and interesting to talk to, although I’d been hoping I might meet some more people like myself, solo travellers or backpackers. Groups and couples tend to already have their itineraries firmly set out, so I just had to enjoy their company for the day before writing them off as what Tyler Durden would call “single serving friends”. Photo on the larger boat, taken by my new temporary friends. View of the wider part of the river from our larger boat. Pool of elephant ear fish at the farm. The last stop of the tour was the centre of the town, where there was a temple complex with several pagodas and statues of Buddha. I hadn’t gotten around to visiting a similar site in Saigon, so I was glad to be able to make up for it here instead, though the more I saw of South East Asia, the more similarities I began to see in all these temples and monuments. Which doesn’t make them any less holy or worthy of reverence – it just means you can’t spend quite as long marvelling in awe at them when you saw that temples bigger cousin in a different city. Overall, my day tour on the Mekong River was pretty average. I guess being a day tour it was obviously going to feel a little rushed, but there was nothing particularly amazing or breathtaking about it. Although it was nice to get out of the city and see some more the of the country of Vietnam, no matter how briefly. One of the more solemn shrines at the temple. After a slow day of recovery from my last night in Saigon, I hopped on an overnight bus towards the riverside town of Chau Doc. Not wanting to travel all the way to Cambodia via bus, I had decided to split the trip up by traveling to a border town on the Mekong River, staying there for a night or two, and then catching a boat up the river to Phnom Penh. It wasn’t as cheap as a bus, but I figured it would be a great way to see some more of the countryside, as well as being one of those rare opportunities to listen to Lonely Island’s I’m On A Boat and giggle smugly to yourself at the accuracy of the content. Though for all the research I had put into transportation, I hadn’t bothered to investigate too much into the town of Chau Doc itself. Crawling off the bus at 5:30am, I was unimpressed (mainly with myself) to find myself alone in a tiny riverside town, where hardly anyone spoke English, at a time where hardly anything was open. “Cheap hostel,” I managed to convey to a motorbike taxi, and we roamed the streets for about 20 minutes, moving from closed hotel to closed hotel. Eventually I gave up and repeated “boat” while pointing at an address in the Lonely Planet guide, and my taxi driver seemed to figure out what I wanted. I found myself sitting at a dock on the river, half asleep while I waited for the world itself to wake. The town of Chau Doc in the grey light of dawn. Despite the dull light of the dawn, my short ride around the city had proved to be very illuminating. There didn’t appear to be any major tourist attractions here, and the level of English speaking locals seemed to be at a concerning low. I could see things going very wrong very quickly in a place like this, and after the bus ride I had just had, it was something I did not want to deal with. In a split second decision I changed my mind, and my stopover in Chau Doc went from a couple of days to a couple of hours, in a couple of seconds. Setting out as the sun rises. Luckily there was room on that mornings boat, so after only a couple of hours of being in Chau Doc, I was speeding up the Mekong River to the Cambodian border. My companions for this voyage turned about to be a bunch of Americans from Philadelphia who were doing a tour through South East Asia as part of a masters program. They were all extremely friendly, and they took me under their wing when we went through the border crossing process, which I was thankful for, since this was the first overland border crossing I’d ever done. It’s a feeling of sheer terror handing your passport over and one check point and then not getting it back until the next one. Once we got back on the boat from the Vietnamese exit point, the rest of the Americans had their passports returned, but mine didn’t come back. I knew it must have been because I still had to get my visa, while the others had obtained theirs in advance, but all the same, it’s still an uneasy feeling. The boat provided some scenic views of rural Cambodia I might not have otherwise seen. But it all went up without a hitch, and I spent rest of the 6 hour boat ride to Phnom Penh chatting to my new American friends, admiring the rural scenery and nodding in and out of consciousness – to say the least, it had been a very long morning. My first weekend in Bangkok felt like a throwback to my previous lifestyle in Sydney – you can take the boy from the party, but you can’t take the party from the boy. Silom Soi 4 on a Saturday night. Earlier in the week, Rathana had put me in touch with a few of his friends in Bangkok, and they had agreed to take me out and show me around while he was still in San Francisco. After dinner, and several jugs of margaritas, I found myself back at Silom Soi 4, though it was a Saturday night this time so the street was a little busier than last time I’d been there. The four guys I was with were all good friends, a couple of them having known each other for nearly as long as I’ve been alive, but they were fantastic company and welcomed me warmly into the group. Conversation was flowing fast and freely, and it usually does between such good friends, and I was privy to some hilarious, provocative, and thoughtful conversations. One in particular that I want to reflect on was a topic that was sparked when we spotted a peculiar couple on the other side of the street. One half of the couple was a young Thai boy with pretty, delicate features – I’m terrible with guessing, ages but I’d say somewhere in his mid- to late-twenties at the most. The other man was older… much, much older. I’m no stranger to age gaps in my relationships, but even I have to confess to feeling a little uncomfortable watching these two canoodle on the balcony of the bar. Some cheeky remarks were made about the couple couple, and the discussion about such pairings being a common occurrence in the area turned to questions of why they occur in the first place. One of our group, who has only just recently moved to Bangkok himself, suggested that some of the younger local boys were almost driven to those types of relationships due to poverty, while the older Caucasian gentlemen use their wealth to effectively buy affection. In response to that suggestion, one of the guys – who we shall call ‘Anna’ – made a point that I personally had never really considered. I paraphrase, of course, but the idea really stuck with me. Even in a Western setting, I’ve had people question the integrity of my relationships with a number of previous boyfriends, whether it be due to ages or otherwise. And the more I thought about it, the more I agreed with Anna. As two consenting adults, these two men have a relationship. Are they in love? Who can say? We didn’t ask them – I know plenty of people in our own Western society who are in loveless relationships, but seeming a little more “normal” helps them avoid much scrutiny at all. The idea that love means different things in different cultures was intriguing, and while I’m sure there’s a multitude of complexities regarding love and relationships in Thai culture that I have little to no idea about, I think the discussion reaffirmed a value in me that I’d temporarily forgotten – love doesn’t play by any set rules, and there’s no such thing as a “normal” relationship. That particular age gap may have given me the heebie-jeebies, but hey, if they’d said that they were in love, then that would have been good enough for me. Dancing in a cage in a Bangkok club – don’t ask me which one, because I can’t for the life of me remember. My period of deep reflection on such complex emotional processes didn’t last long, though. A few more margaritas later and I was ready to hit the dancefloor. I think that’s what I like about a good gay bar – you can be millions of miles away in a foreign city, surrounded by people that you’ve never met and probably never will, but when you’re shaking your stuff on a crowded dancefloor to a Britney Spears remix, it’s always going to feel like home. One of the big tourist destinations that you just have to see (or so I’d been told) when you are in Bangkok is the Grand Palace and the Royal Monastery of the Emerald Buddha. Even if temples aren’t really your thing, this one is so spectacular that its supposedly the one everyone has to see. But having studied mediation under the guidance of a Buddhist nun during my last few years of high school, I would definitely say I have an interest, or at least curiosity, in Eastern spirituality, and a certain sense of awe for their places of worship. So after seeing having seen some of the party destinations that are frequented by tourists, I decided I would begin this week by exploring some of the more traditional cultural attractions that Bangkok has to offer. The Grand Palace is located towards the west of central Bangkok, on the eastern side of the Chao Phraya River. Since the palace is the official residence of the Thai royal family, the inside is not open to the public, but the monastery compound that houses various shrines, temples and monuments is usually considered the main attraction anyway. The temple that houses Emerald Buddha, while being a popular sight-seeing spot among tourists, is also still a frequently used place of worship for both the Thai royal family and local commoners. Therefore, respectful and modest clothing is required before tourists are allowed to enter the compound within which the temple is located. This means no exposed shoulders or knees, no singlets or shorts, so I made sure I packed my jeans into my backpack to change into once I got there. The midday sun was scorching and the heat and humidity had basically drenched my whole upper torso before I’d even made it inside the gates, so actually wearing long pants the whole day was definitely not a valid option. Once inside, it was easy to see why this place was considered a “must see” destination – the intricacy of the beautiful and delicate designs is absolutely breath-taking. The beautiful hand painted murals that line the outer perimeter of the temple compound. The murals depict the story from an epic poem in Thai mythology. The cloisters that run along the inside perimeter of the compound are decorated with exquisite hand painted murals that depict the storyline in a famous epic poem from Thai mythology. Princes and princesses, armies of soldiers, monkeys, demons, giants, gods, temples, palaces – the detail is incredible and the work is flawless. Much of the subjects within the murals are laced with gold, and the walls glow and shine, beautiful and incredible works of art. Within the rest of the compound there are dozens of other structures the are wondrous to behold, with glass, jewels, gold leaf, mother of pearl, and a score of other materials decorating them in a way that lets them command the reverence they deserve, as such sacred and holy monuments. Some of my favourites were the golden statues of the mythical creatures that were half animal and half celestial beings, crafted with the finest, most precise detail, glowing magnificently in the sunlight. One of the golden statues of a creature from Thai mythology. The highlight of the compound, however, is the Royal Chapel of the Emerald Buddha. Built on consecrated ground, all who enter the area are required to remove their shoes. I slipped off my sneakers, ascended the stairs onto the outer platform, and entered into the temple. The walls were vast and tall, decorated with beautiful murals similar to ones on the outer walls, depicting scenes from the life of Buddha, as well as other concepts of Thai mythology. Though it is the shrine in the centre of the room that truly captures your attention. Mounted high atop the shrine, on a golden throne made of gilded-carved wood, is the tiny Emerald Buddha, actually crafted from green jade. He is sitting in a stance of peaceful and relaxed mediation. The statue is hard to make out at first, such a small idol atop such an extravagant display, but the sight of the entire shrine is impressive, golden and glittering amongst the glow of they prayer candles, and for me it did feel like quite a spiritual experience. Perhaps it was because you cannot take photos inside the main temple, so being there really feels as though you are witnessing something truly special. I made my way past the standing tourists the where the prayer-goers were situated, and kneeled among them while I gazed up in awe at the shimmering golden shrine. It had been quite a while since I’d practiced mediation on a regular basis, so I sat there amongst the prayer and worship, absorbing the sacred presence within the temple and taking a moment to reflect on my own personal spirituality. View from outside the temple of the Emerald Buddha. 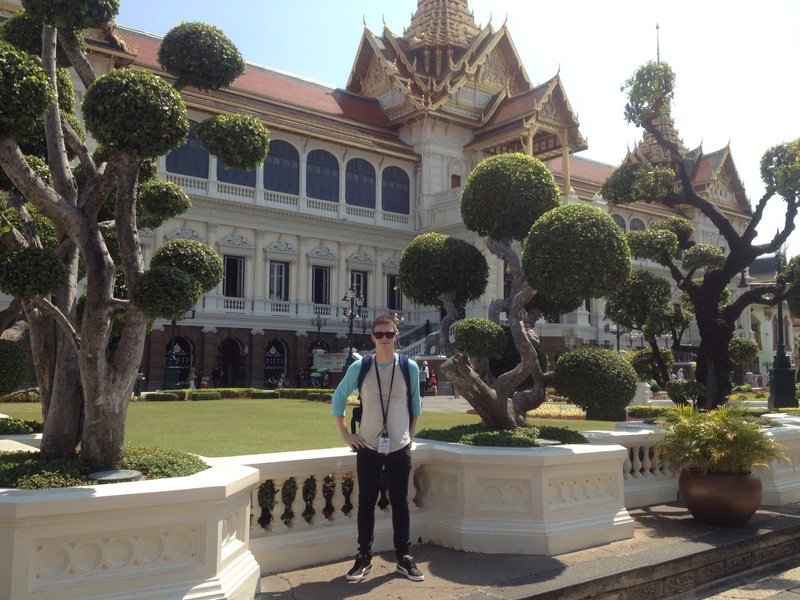 Myself in front of the Grand Palace. The guards are apparently favourites for taking photos outside the palace. Some marching guards that passed me on my way out of the palace grounds. After spending some time within the temple, I emerged to continue the rest of my tour around the grounds of the Grand Palace. However, after wandering around in the sun for a couple of hours, I’d become quite exhausted, and so decided to make my way home. After wandering the streets looking for a taxi, and now avoiding basically every tuk tuk I encountered, I finally found a taxi rank for motorbikes. They asked me where I was going and named a price – it wasn’t too dissimilar from what I’d paid in the taxi in the way over that morning, so I accepted. Motorbikes also had the advantage of being able to weave in and out of places that cars and tuk tuks are unable to, making them a convenient choice for peak hour traffic. Knowing that my mother would possibly have a field day when she heard eventually heard about this, I climbed onto the back of the motorbike and we took off into the street. Monument that serves as a roundabout near the palace – taken before I was on the motorbike! It was such an exhilarating rush. Sitting with my arms pressed heavily into the sides of my driver, we weaved in and out of traffic, between lanes, cutting in front of cars and tuk tuks, zooming through the streets among the pack of other motorcycles. The wind was flying through my hair, as the driver was the only one who had a helmet, and while I know that’s incredibly dangerous, I had a weird sense of absolute trust in this driver and his knowledge of the roads. I’d had some other locals say that driving in Bangkok isn’t scary or unsafe at all, and that only driving out in the more regional areas is something they hate or refuse to do, with city driving being considered relatively safe. I hadn’t believed them at first, but as I zoomed through the open air and soaked up the scenery as we weaved between vehicles, I think I finally understood what they meant. The city almost operates like a well-oiled machine – except in the traffic jams, where a little oil mightn’t go astray – or a living organism, where no matter how hectic or chaotic the environment may seem, everything is aware of and in sync with everything else. I’ve yet to see a single accident on the roads of Bangkok – plenty of what we would call “near misses” back home, but sometimes it feels as though the drivers of Bangkok know their roads so well that they can intentionally come so close with a much lower risk of accident. A tight-knit, well-oiled machine. Towards the end of our trip, my driver even mounted the footpath and weaved between pedestrians to get me on the right side of the road and home as quickly as possible. When I paid the driver and slipped off the back of the motorbike, he smiled at me and placed a hand on my chest, and waited a moment before chuckling to himself. I must have had a rather puzzled look, because he proceeded to mimic the action on himself, then beat his chest a coupe of times with the palm of his hand. He repeated action on my chest, and then I realised what he was trying to communicate – my heartbeat. Placing my own hand on my chest, I felt it pulsing at a ridiculous speed that I hadn’t even noticed myself. Perhaps I was still a little high from the adrenaline of soaring down the tiny streets and open roads alike on the back of that motorbike, but it wasn’t until he drove off that I realised just how much of a thrill the simple trip home had been, and how much I had really enjoyed it. It was a short walk home from where I’d alighted the motorbike, and I skipped off down the street with a new spring in my step. For perhaps the first time during this trip I finally felt like a traveler – not just a tourist, running around trying to see the cities greatest hits, but a real traveler just taking pleasure in the simple activities and cultural quirks that my new temporary home has to offer. I’d had a few difficulties getting used to being on the road and settling into my new, inconsistent lifestyle, but it was only a matter time before the travel bug finally kicked it, and I’m now more eager than ever to see not just the rest of this sprawling city, but to keep moving and behold the wonders that this country, this continent, and indeed this world, has to offer. I was staying with my friend Rathana, another person whom I knew from Sydney but had since moved to live abroad. However, his work frequently takes him to all kinds of places across the globe, and as fate would have it he was to be in San Francisco when I touched down in Bangkok, though he’d generously offered for me to stay in his place without him until his return. I used my basic directional knowledge from last time I’d been in Bangkok to make the short walk from the BTS (another name of for the Skytrain – an above ground railway system just as efficient as Singapore’s MRT) station to his condo, where I met one of his co-workers to collect his keys. After spending the afternoon resting and enjoying having a private space to myself, I began to feel hungry, so I decided to take a wander through the streets of Bangkok and see what I could discover. Within half an hour I was back in the condo, feeling more than a little shellshocked. I’m not sure what I was expecting – I was well aware that I was in a foreign country, with its own language, rules, customs and culture, but I think it was more of an overestimation of my own ability to adjust and adapt. You can read all the books and reviews in the world, and somehow I don’t think anything can totally prepare you for the real thing. I set out into the streets, taking note of my surrounds yet heading in no particular direction, making turns here or there, wherever there seemed to be something interesting happening. I found myself in what I later discovered was the tiny and localised Muslim district of Bangkok. Street vendors lined the narrow road, young children played in the streets naked, stray cats prowled the gutters and whole families were lounging around in what seemed to be one room houses, surrounded by fans and in various stages of undress, in order to combat the sweltering heat and humidity. Motorbikes weaved between the people, and even cars nudged their way through the street like they were just oversized pedestrians. Determined to not look like the nervous tourist which I so obviously was, I trudged through up the street keeping mainly to myself, occasionally stopping to contemplate some of the street food carts, but moving on when my presence was either ignored, or met with a bored indifference. Of course, I don’t blame them for probably resenting my gawking – I was the one who had wandered off the main concourses into the tiny street which had little to no obvious tourist attractions. Yet in the end the whole thing became so overwhelming that I navigated my way through an alley or two until I reached the main roads, grabbed a handful of snacks the convenience store and dragged my shaken self back home. Maybe it was the fact I had set out into Bangkok by myself for the first time in the cover of night, or maybe it was just because I’d really had no idea what I was doing – I resolved that from now on I would always have a plan of attack. The next day I tried to wind it back and ease myself into the culture shock a little more gently, spending the day revisiting some of the areas I’d been to before. I had lunch in the predominantly English-speaking area of Ari, and then headed to Siam to wander through some of the biggest malls in Asia. I’d noticed my throat becoming quite sore since the morning I left Singapore, so I found a pharmacy with an English-speaking doctor, who gave me a simple three day course of antibiotics. After that, I decided to lay low the rest of the day in an attempt to recover. Another of Rathana’s friends was to be staying at his place for a few days while he was away, so I ventured down to the BTS station to collect her and introduce her to Bangkok as best I could. She was in town for a conference over the weekend, so I would end up seeing very little of her during our shared time in the condo. The next day I was feeling a bit better, so I set myself some challenges for the day, to help me get used to traveling solo around Bangkok. After doing a bit of research, I picked one restaurant for lunch and a nearby tourist attraction, studied the maps, and head off into the city. I never found the restaurant, and trudged around the streets in the hot sun for close to 40 minutes, getting lost and confused by the mostly non-English street signs, before I eventually stumbled upon a very Western looking burger joint. At that point I was willing to trade a cultural experience for a bit of cool air-conditioning, so I stopped and ate. From there it was on to the Queen Saowaphat Memorial Institute and Snake Farm. A couple of years ago, I developed a pretty intense snake phobia through a bizarre incident that is a whole other story of its own, and have been working ever since to try and overcome my fear. The snake farm is affiliated with the Red Cross Institute in Bangkok, where a lot of research into toxicology and the creation of snake bite anti-venom takes place, but it also offered snake handling shows in the afternoon, so I’d chosen the attraction in the hopes that maybe I could overcome some fears and gain some confidence I had lost after my first shaky night in Bangkok. Cobra in the exhibition area. 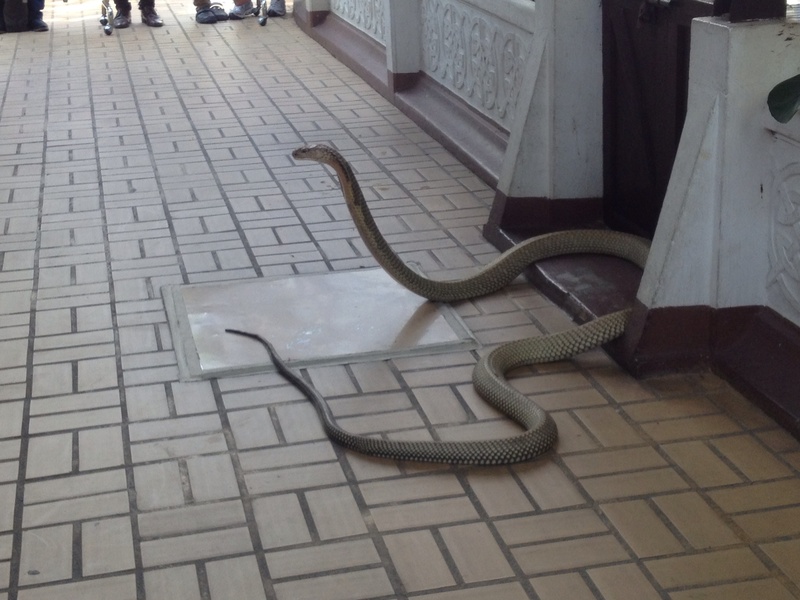 And the King Cobra that was a little close for comfort! Looking quite fierce, and most displeased. So you can imagine my horror when the first thing they do is dump a King Cobra on the ground, no more than 4 or 5 metres from where I was standing. The snake itself would have been more than half that distance had it been fully extended, but instead it writhed around and coiled itself, its hood scales fully spread and hissing angrily at the handlers around it. After the initial shock, and realising there were quite a few people between the cobra and myself, I managed to calm down and watch the show without being too anxious or nervous at all – quite a feat for someone who had to watch scenes in the last Harry Potter film between slits in my fingers to avoid seeing Voldemort’s giant pet snake. Come the end of the show, they called for a volunteer, and I was standing too close to the demonstration area to not get selected. I’d seen shows like this before, and I knew what was coming – but as per the challenge to myself, I didn’t resist, and allowed for the huge python to be draped across my shoulders. It was such a thrill, and I was surprised to find that I wasn’t really scared at all – phobia smashed! I even held it long enough to ask to get my picture taken, in case nobody back home would believe actually me. Finally squashing my snake phobia for good! Maybe all the attention tired the poor thing out? As I left the snake farm, I was accosted by a tuk tuk driver who asked if I needed a ride. I knew the way back to the station, yet I let myself be dragged into a conversation. “For just 20 baht, my friend, I will take to back to the Sala Daeng BTS station. But please, can we make one other stop along the way?” I told him that I didn’t have anywhere I needed to be, and as he explained I realised that he was trying to get me to visit a shop, presumably that of a friend, or an employer of sorts. Assuring me I only needed to have a look and not necessarily buy anything, I threw caution to the wind and gave in to what might actually be my first authentic Bangkok experience. The store turned out to be a tailor, and I soon realised it wasn’t quite so easy to browse a store that doesn’t actually have a great deal of products already made. I was quite insistent to my salesman that I didn’t need a suit, but in the end I caved, I ended up walking out of the store having been measured up and paid for two tailor made shirts. They were supposed to be delivered to Rathana’s condo the next evening, but are yet to arrive, and now I’m starting to feel I may have been swindled by an elaborate scam. Though I’ll hold my breath just a little longer, in case there was a legitimate delay. The tuk tuk driver was delighted I’d made a purchase, and I think that was a sign to him that maybe he could pump even more upselling into me. As we continued on our way, he turned and called back to me, over the drone of the traffic, “Lady? You want a lady? Ping pong show, yes?” I politely declined, though I ended up browsing through a jewellery store before I firmly insisted that I needed to go back to the station. He was a very cheery man, though. “I like you, you’re a cool guy,” he repeated several times. He asked me if I was going out partying that night, and when I alluded to it being a possibility, he wanted to get my phone number. Given the tricky nature of my travel SIM card, I managed to squeeze my way out of that one, but in retrospect it seems he had made a pretty big squeeze out of me, in one way or another. After finally returning home and showering, I was off again to catch up with a friend. Brendon was the older brother of one of my best friends from high school, and had spent the better part of the last 3 or 4 years living and studying throughout Asia. He’d gotten in touch when he realised we would both be in Bangkok at the same time, and invited me to dinner with his group friends from his time at university here. Having spent most of the past three days on my own, I jumped at the chance to hang out with some locals and people who actually knew the city. We had dinner at a nice restaurant where I was introduced to the group, but it was what happened after dinner that was the real Bangkok experience. Rich, one of the girls, was going out to help celebrate her brothers birthday, and she urged Brendon and I to join them. Brendon was only in town for two nights and wanted to make the most of it, and I literally had no where else to go, so we jumped in a cab and I let them lead the way. That’s one way to get a target market? I chuckled to myself at the name, another of the novelty clues highlighting that we were definitely not in any regular Australian party strip. We sat down and ordered drinks – table service in clubs is another thing that I wasn’t used to, although I’m now under the impression it’s pretty common in most places in Thailand, or at least Bangkok. As we sipped on our Singapore Sling cocktail buckets (the only drink worth getting here, Rich assured us), various other street sellers would approach us from the busy road and insistently push their products upon us. Among some of my favourites were the material wrist bands that contained all kinds of messaged woven into them, from sweet to naughty to just plain strange, and what appeared to be char-grilled scorpion skewers. I didn’t buy anything though – the wrist bands because I couldn’t decide on one hilarious slogan without wanting to choose them all, and the scorpions because… Well, nothing about them looked appetising in the slightest. I usually say I’ll try anything once, but after watching a British backpacker dry wretch and nearly vomit everywhere after eating her scorpion, I decided it was an experience I could live without. Singapore Slings – where else but Thailand? When we’d decided we’d drank enough, we retreated to the neighbouring nightclub, partly because we wanted to dance and mostly because we knew the place was air conditioned. We danced for a while before we decided to leave and head to another district. After getting some Pad Thai from a street vendor, who cooked the whole meal in under two minutes right before our very eyes, we were in a taxi bound for Silom Soi 4. It was the gay district, Brendon explained to me, which was why Rich found herself there so often. “I just feel so much safer there”, she said with a laugh, while Brendon made a remark about feeling quite the opposite. I was unsurprised that I’d managed to find a fag hag on my first night in Bangkok, and I was pretty excited to check out what kind of gay scene existed here. Unfortunately it was a Thursday night and already well past 1am. We all ordered one more drink each, but by then we were all starting to feel pretty tired. I said my goodbyes to Brendon, and exchanged numbers with Rich in case I should need any more help navigating the party scene of Bangkok, then we all found cabs and made our separate ways home. The bustling district of Khao San. Pad Thai as a drunk meal is a bit of a novelty for me, but there were dozens of carts serving them along Khao San. It had taken a few days, but I felt like I was starting to get the hang of Bangkok. There were the obvious language barriers in some places, which I was expecting, but you’re usually never too far from someone who can speak English, or provide a basic translation. The night out with Brendon and his friends had been a nice change from trying to discover and navigate the city on my own, and I began to think that while free accommodation with friends was definitely a bonus, I hadn’t anticipated it to be quite so lonely without Rathana actually being here. I figured it would be easier to make friends when I’m staying in hostels, surrounded by other backpackers, than it was when I was tucked away in my own private apartment. I’d spoken to a few friends back home during my brief periods of feeling a bit lonely, and they all assured me that it would get easier, and I had to remind myself that I’d really only been out of Sydney for a week. That was nothing in the grand scheme of my planned world tour, though sometimes it already felt like I’d been gone for such a long time. I knew all that would change with time though, and so I just took it in my stride as one of the many more personal challenges I’d face this year. A lot of people seemed pretty confused when I told them what the first stop was on this round the world tour of mine. Assuring them that it was indeed my first destination, I was queried as to how long I would be staying in the city of Singapore, on the tiny island country of the same name. Singaporean flag on top of the Ministry of Information, Communication and the Arts, formerly Singapore’s first police station. The first thing I noticed when I hopped off the plane at Changi Airport, other than the overwhelming humidity, was that one of my two travel money cards was missing. The one that I could find refused to work at any of the ATMs that I could find at the airport – because that’s just the kind of luck that travelers have, right? Luckily, my travel SIM card did work, so I got in contact with Tim and hopped into a taxi to head over to his apartment. The taxi accepted card payment and, much to my relief, this time the temperamental card decided to work. After heartfelt greetings and stressful explanations, I called my mother in Sydney to confirm that I had left the second card at home. While still a little annoyed at myself, I felt a wave of relief in knowing that it was safe, and not out racking up an illegitimate bill somewhere else in the world. For the rest of the evening the two of us caught up and exchanged stories, as reunited friends usually do, so it wasn’t until the next day that I set out into the city as an explorer. After a lazy brunch with Tim’s family, who were also visiting Singapore to see him in his graduation show, Tim had to return to college for rehearsals and then preparation for that evenings performance. But he only had one set of keys to his place (his family were staying in a nearby hotel – I was the designated couch-surfer), and negotiation worked out that he would require them today. So I set out into the muggy afternoon, knowing I wouldn’t be able to return home until after that Friday night performance. Without a doubt, the first thing you notice in Singapore is the humidity. Sydney was trying its hardest to make me sweat when I was back home, but it really doesn’t even come close to the sheen across my forehead as I wandered down Orchard Road. It eventually gets to the point where you abandon even attempting to look fresh – it’s hot, it’s humid, and no one expects anything less than a giant ball of perspiration. On this particular afternoon, however, the humidity reached breaking point, and a monsoonal thunderstorm was unleashed upon the city. Rain bucketed down as I scampered into a 7-11 to buy a cheap umbrella (although I’d already been dripping wet with sweat), and the skyscrapers and shopping malls turned the streets into huge metallic tunnels that boomed and echoed with every clap of thunder. I ended up passing through a lot of those shopping malls to avoid the rain, but the air conditioning inside was so chilly that I would continually have to drag my damp self back into the natural air so that I didn’t freeze to death. One of the many small gardens that break up the mass of buildings along Orchard Road. The number of shopping malls in Singapore is astounding. I saw virtually every label I know, and plenty more that I’d never even heard of. The thought of walking through them with the intention of actually shopping seemed particularly overwhelming, but the prices in Singapore aren’t exactly competitive on an international scale, especially within South East Asia, so I decided to put off any intended purchases and try again in a more favourable economic climate. Something that I did take a particular interest in was the amount of greenery that fills the streets of Singapore. You won’t go a block or two without finding a small park or garden, or a huge tree holding its own among all the modern architecture. Tim mentioned that it might have been some sort of initiative of the city in order to maximize the space in the city without turning it into a stock standard concrete jungle void of any real kind of natural elements. Then there are buildings like the School Of The Arts, Singapore (SOTA), with its extreme proximity to the surrounding trees and surfaces covered in luscious vines and foliage, which are perfect examples of just how seamlessly this city is able to integrate the man-made and natural worlds. View from below of the School Of The Arts, Singapore. Later in the afternoon, after the thunderstorm has passed, I emerged from the malls and headed south on the MRT train system (which, I must add, are insanely efficient that it makes Sydney’s CityRail look like even more of a joke), down to Clark Quay to take one of the boat tours that operated on the river. The leisurely trip took us on a guided historical tour, down to bay with some impressive views of the equally impressive Marina Bay Sands, a relatively new casino, bar/nightclub and hotel. I was happy quietly taking my own photos, but I couldn’t turn down the offer from the friendly and enthusiastic staff to take some photos of myself with the scenery, and so I ended up with my first, of what I’m sure will be many, awkward solo holiday snaps. “Hold the flower, hold the flower!” the river tour guide shouted eagerly. I’m still not sure what the building is, but the towering Marina Bay Sands is visible behind me. On the river tour, with the Singaporean CBD in the background. The Merlion, a popular tourist attraction in the bay. After the tour, I strolled around the streets of Clark Quay, but the ritzy upmarket restaurants and bars didn’t feel like the best option for a sweaty, lonely backpacker, so I jumped back on the MRT and looked for a new destination (Did I mention how efficient the MRT is? No, really, maximum waiting time for a train going anywhere is about 6 minutes – you don’t even look at the timetables and plan ahead, you just go!). I had intended to alight at Marina Bay and explore on foot what I had seen from the boat, but following the instructions on some of the signage, I alighted at Bayfront and found myself on the other side of the towering Marina Bay Sands. Instead of being greeted by the water, I found myself in Gardens By The Bay, an area of roughly 100 hectares of reclaimed land that has been transformed into a huge garden, but with a futuristic twist. The area is sprinkled with structures called the Supergrove, which look like huge wire frames in the shape of trees that are slowly being taken over by a climbing garden. By this stage it was dark, and the odd structures were twinkling and shining with bright, multi-coloured lights, though I was unable to ascertain just what they were, exactly – other than the central and tallest Supergrove tree housing a Chinese restaurant on the top floor. The Supergrove trees in the Gardens By The Bay. If I’d thought that the design of Orchard Road had been the integration of modern technology with the natural world, then this little number had taken it to whole new level. There were a couple of ticketed exhibits in the Gardens By The Bay, but they were closing by the time I had arrived there, so I just settled for wandering around in the muggy air and soaking in the beautiful, illuminated sights. Without the harsh equatorial sun beating down on you, the climate was actually kind of pleasant, and with the mood-lit surrounding, I realised given the right company, the setting would have been quite romantic – I began to wish I’d had someone there to share it with. From there, the solitude of my day finally caught up with me, and I decided to call it a day and head back to the city and wait for Tim to arrive home. The next day was Saturday, and that evening I would be attending the Tim’s show. He was busy for most of the day with a matinée performance, so I decided to continue the theme of exploring the paradoxical man-made natural environments of Singapore by visiting the Botanic Gardens. I don’t know what I was expecting, but you can colour me impressed. The gardens are huge, but they also feature an extensive collection of plants from all kinds of environments. There were walks through rainforest areas, gardens of cacti and other desert plants, hundreds of varieties of flowers and orchids, scented gardens full of beautiful and invigorating floral fragrances, and even an area dedicated to plants and herbs that have medicinal properties, categorised by their purpose and function. I spent several hours wandering through the gardens, taking pictures and studying the plants, and I found it quite fascinating. I live in the heart of the city back in Sydney, and while the area does have its share of parks and greenery, there’s nothing quite like the Singapore Botanic Gardens. As the afternoon continued, though, the weather cycle of the previous day repeated itself, and I was caught in another torrential downpour. Having seen the best that the gardens had to offer, I called it quits and headed back home – luckily I had the keys to the apartment that day, so I was able to dry off and spruce myself up for the theatre. Tree from the rainforest walk in the Botanic Gardens. One of the hundreds of varieties of flowers in the Orchid Garden. 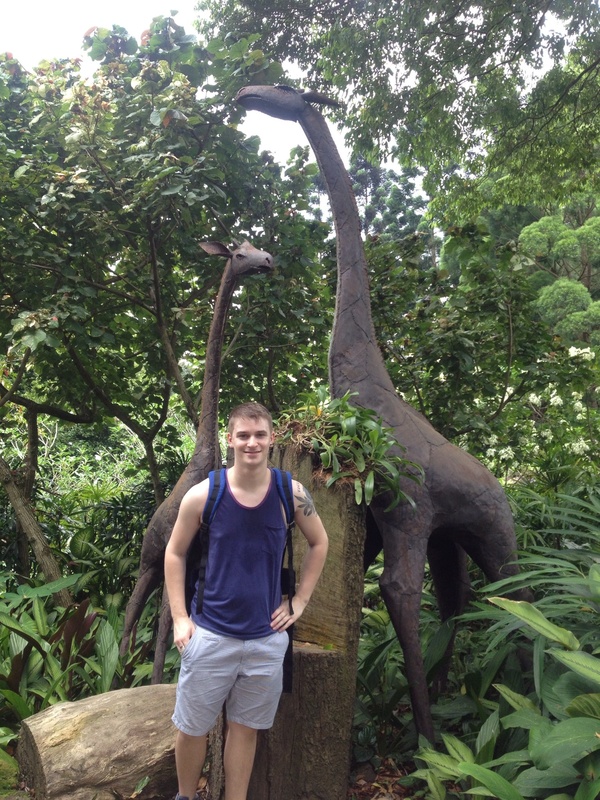 Some giraffe statues in the Orchid Garden – figured I should have at least a photo or two with myself in it. The performance was excellent – it was especially a thrill for myself, considering I knew almost all of the starring cast. Gypsy is probably one of my favourite musicals, but this isn’t a musical review so that’s all I’ll really say on that topic. However, the shows after party was the setting of what was probably the biggest culture shock in Singapore. The party was held at a bar down at Marina Bay Sands, a swish little place called South Coast, which is owned by a lesbian couple who are originally from the central coast of New South Wales – small world, huh? After Tim’s brother bought a round of drinks, I approached the bar to take my turn. I ordered a cider for myself, one for Tim to congratulate him on a fantastic final show, and beer for his brother to repay the drink he bought me. When the bartender added up the cost, I was barely able to stifle a small shriek when he told me the total was just shy of $50. That’s in Singapore dollars, but even with the conversion, it was a hefty bill that I wasn’t expecting. It cleaned out all the cash in my wallet, to say the least. Alcohol in general is just more expensive in Singapore (pro tip: DUTY FREE!!! ), so when you go out to nicer places it can only be expected that it will be more expensive. Luckily for me, this was a musical theatre party. There was no shortage of homosexual men, and I worked the room to my advantage and scored a few frozen margaritas free of charge. Drinks turned to cocktails, cocktails turn to shots, and before long I was sitting there at the bar convincing myself that now was not the time to be sick. I kept it together, thankfully, though in retrospect I’m just a lot more grateful I wasn’t footing the bill of whatever had gone down. As the bar closed around us at 4:30, those still standing stumbled through the hotel lobby to the taxi rank. I may have accidentally given Tim a hickey, and shared a few cheeky moments with one of my suitors in the back of a taxi, but it was all harmless fun, and Tim and I eventually stumbled back into his apartment very close to sunrise, and spent most of the rest of the weekend sleeping off our hangovers. The rest of my stay in Singapore was quite relaxed and mellow, spending time with Tim, his family, and his classmates. We visited the bar at the top of Marina Bay Sands, sipping on some expensive cocktails while enjoying the panoramic views of the 57th storey, but that was the only other tourist-type activity I did. On my previous visit I had wandered the streets of Little India, experiencing the dramatic cultural shifts at every turn of a corner. The extent of the multiculturalism in such a small geographical space is actually quite amazing. Though this time around, I spent my remaining time with my friends, now that they had the stresses and pressures of their show behind them. Tim and I with our cocktails on top of Marina Bay Sands. Panoramic view from the 57th level of Marina Bay Sands at night. As I reflect on the five nights I spent in Singapore, I would say that it was a good place to start my journey, because while it was in a completely new country, eight hours away from my hometown, it was still full of places, people, and experiences that still felt quite familiar. It was a good transitioning period, where my life was a strange mix of the schedules of other people and my own freedom from any specific restraints or responsibilities. In a way it didn’t even feel like the real adventure had begun yet – it was just one last pit stop before I threw myself into the real unknown. It took me away from my home, but not quite out of my comfort zone. I watched other people go about their daily routines while I woke up on their couches, and the fact that I was not going to have that kind of regularity for the next nine months was able to slowly sink in, rather than simply being thrust upon me. A couple of times I felt lonely, and I’d be lying if I said I hadn’t wanted to steal a few kisses in that taxi, but that can only be expected within the first week of leaving your old life behind, and something I’m sure I’ll get used to in time. Now the transition phase is over and I’m truly setting out on my own, and while I’m still a little nervous about the rest of what South East Asia has in store for me, I feel like my time in Singapore was an adequate stepping stone of preparation. So onwards with the adventure – Bangkok, here I come!